A very meditative, thoughtful (if not altogether haunting adaptation of Peter Rock's My Abandonment), Leave No Trace is good, sometimes very good, but rarely great. Nonetheless, it shines a light on a very pressing social issue of our time (and arguably all time): Is it possible for war veterans to reintegrate fully into society, and what of the rest? Many, many do not, and approximately 22 U.S. veterans die by suicide each day. The strongest military in the world, backended by shameful care upon return. It is a heartbreaking situation all the way 'round, and one I have never been able to reconcile within my mind. I suppose, like most things, it's a matter of economics and efficacy. We are eager to buy F-35s, but what of squishy long-term psychological care that is difficult to assess? 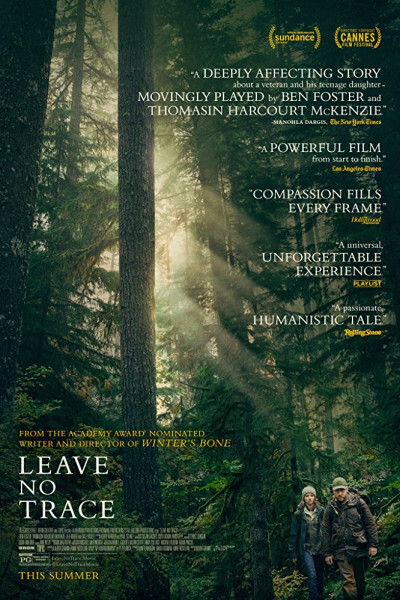 Leave No Trace follows a PTSD-struggling veteran-father whose solution is to remain in the woods, further exacerbating the pubescent/adolescent difficulties his precious daughter already faces whilst simultaneously struggling to cope within a life of isolation and disconnection alongside her father of few words. The film left few of us tearless, and most of us somewhat despondent. On the bright side, Ben Foster remains a national treasure, and I shall look optimistically (as I always have!) toward everything he brings me. 3:10 to Yuma, The Mechanic, Lone Survivor, Hell or High Water, Hostiles? Yes please, more! And Thomasin McKenzie, for what it is worth, is a standout as his daughter. Delicate and beautiful, she is both porcelain and a virtual finch, conveying volumes with perhaps one beep per day.